Summary: The TUF FX504 is a new entry from Asus in the budget to mid-range segment of gaming notebooks. 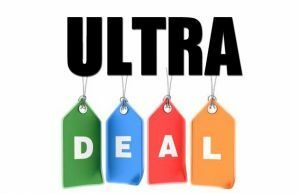 Its main selling points are the 120 HZ screen, the hardware specs and the excellent keyboard, corroborated with an affordable pricing policy and a few extra perks. The performance in demanding loads is a potential concern though, based on what we found from this review unit, and there are a few extra quirks you should be aware of before taking the plunge. Read on for more details. 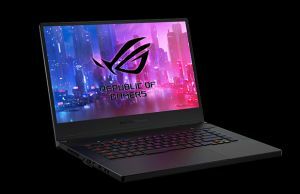 The niche for full-size laptops under $1000 able to handle 1080P gaming with ease is highly competitive as of 2018, with most OEMs offering at least one unit in this segment. The competition drives down prices and at the same time, drives up the overall quality of the available products. 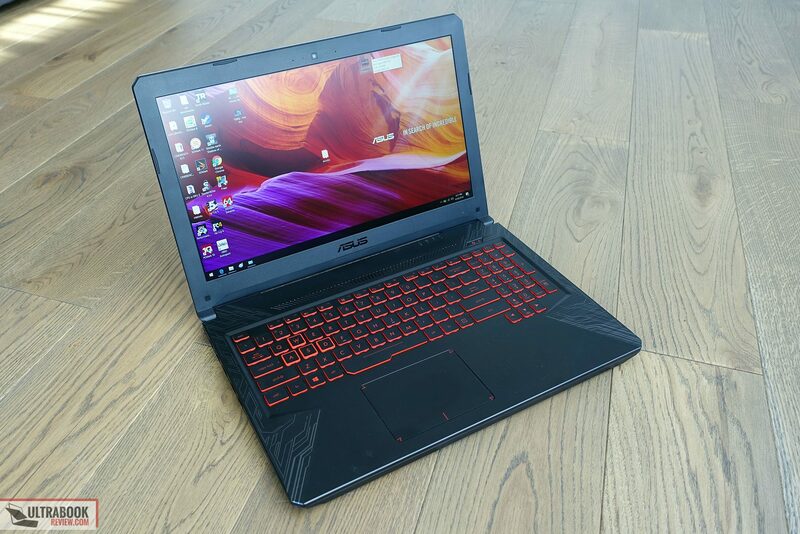 The Asus TUF (The Ultimate Force) FX504 series is Asus’s new entry in this niche and includes 15-inch gaming laptops built on Intel Coffee Lake hardware platforms and Nvidia GTX 1050 and 1050 Ti graphics, with a starting price of around $700 in the US. 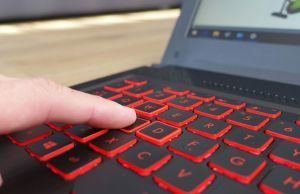 These laptops are not just powerful hardware-wise though, they’re also built well and designed to withstand the daily hassle, incorporate good backlit keyboards and a high-refresh rate screen. 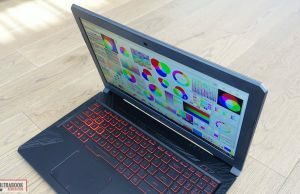 We’ve spent time with the higher-end configured model of the TUF FX504 line, the FX504GE that comes with an Intel Core i7-8750H six-core CPU, Nvidia GTX 1050 Ti graphics and hybrid storage, and we’ve gathered all our impressions below. Read on if you’re interested in getting one of these and want to know more about its strong points, quirks and issues. 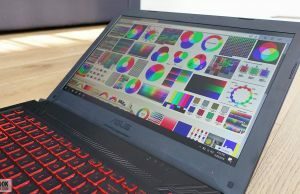 Asus offers the FX504 notebooks in a few different configurations, split between three base sub-lines: the FX504GM with GTX 1060 graphics, the FX504GE with GTX 1050 Ti graphics, and FX504GD with GTX 1050 graphics. There are also options for either the i5-8300H or the i7-8750H processors, various amounts of RAM and storage, but all the other traits are shared by all the available variants. As of the second part of 2018, Asus offers an updated versions of this laptop, the TUF FX505 series, with a smaller build, 144 Hz IPS screen and improved performance. You can find all about it in our review. 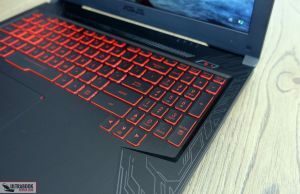 The TUF FX504 borrows some aesthetic lines from the existing ASUS ROG notebooks, but is for the most part a brand new design, completely different from the design of the FX503 line it replaces. It’s up to you whether you’ll like it or not. Personally I’m a fan of plain and simple designs, and on one side this one doesn’t get any flashy color accents aside from the red bordering on the keys, and doesn’t get any sorts of annoying lights either; but on the other, the interior is perhaps a bit over-crafted for my taste, with that pattern on the sides that somewhat mimics circuit lines. It’s not ugly though and I could get used to it. 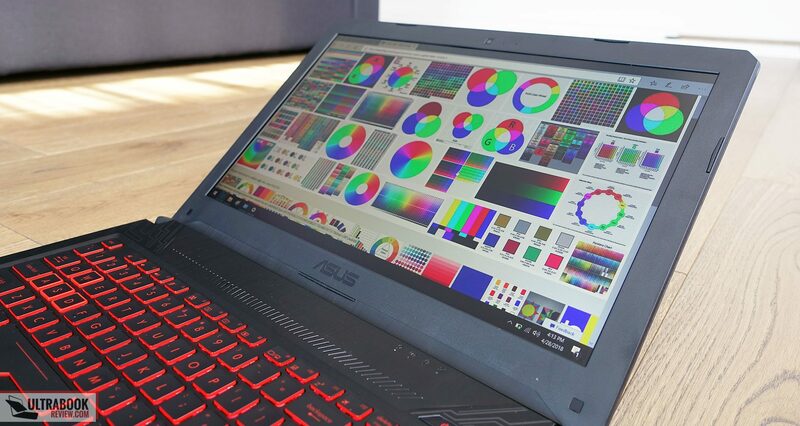 The images on the official page suggest some red lines on the laptop’s lid and on the interior, and that’s because Asus offers the TUF FX504 in 4 different colors schemes: Black Matter, Red Matter, Fusion and Premium Steel. As far as I can tell we have the Black Matter version here, with the simpler hood and dark-silver lines on the inside. I find all these options confusing for the potential buyer, especially since I couldn’t find the differences between them properly explained on the site, so you’ll want to further look into this and make sure you choose the color scheme that best suits your taste. 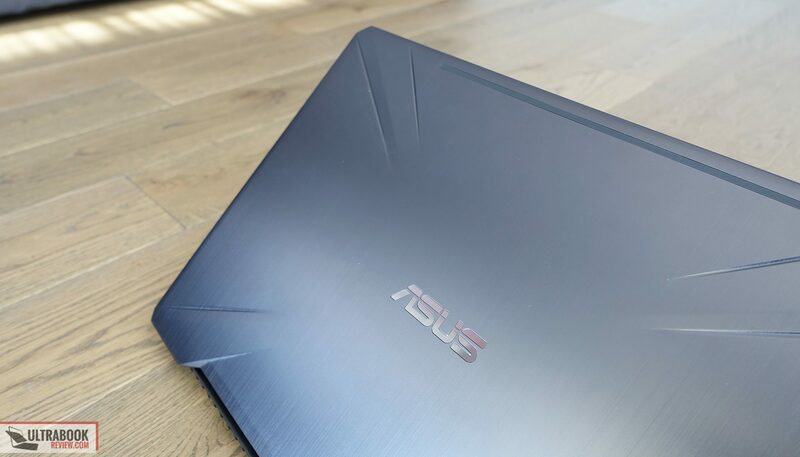 We do know that the Premium Steel version will get a red backlit Asus logo on the lid, which could have an impact on your purchase decision. As far as the build goes, the chassis and outershell of the FX504 are made out of the plastic, while the lid cover gets a brushed metallic finishing. There’s little to complain about the craftsmanship quality. 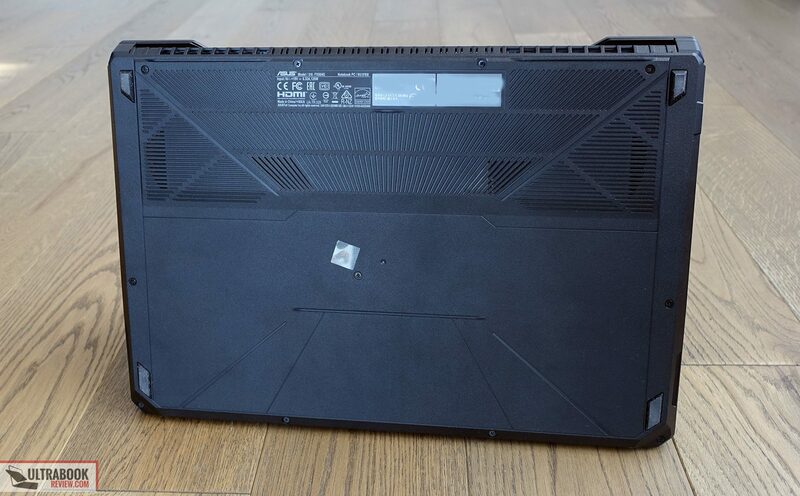 Yes, there’s some flex in the lid and the main deck, but let’s not forget the price range this notebook competes in, so overall I can conclude that the FX504 is built well and should also age fairly well, as Asus went with textured materials for the inner deck which shouldn’t scratch or wear down easily. There’s nothing truly special about the size and the weight of the TUF FX504, as at 5 lbs and 1-inch in thickness it blends in with the crowd, albeit in all fairness it is one of the more compact and lighter options in its class. I’m also pretty happy with the laptop’s practicality. The screen for instance is hold in place by two solid hinges and can be easily lifted with a single hand. 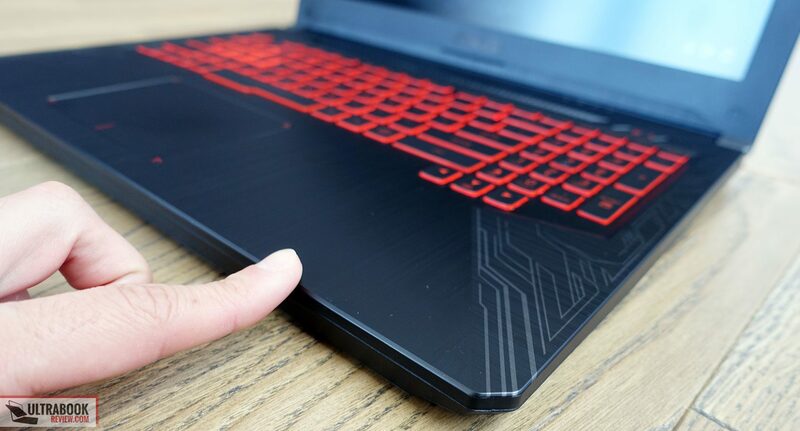 The palm-rest is spacious and there are no sharp bits or edges to dig into your wrists like with many other laptops, as Asus made sure to blunt the edges and cut the corners, and on top of these the TUF FX504 has a pretty low profile as well. 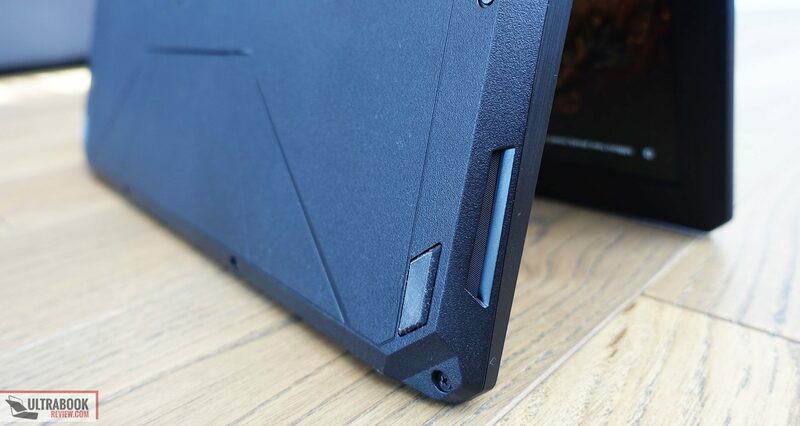 The feet on the bottom are rather small, but grippy enough to keep the computer well anchored on a flat surface, and you’ll notice that Asus added a few plastic feet in the middle of the back-panel as well, to reduce the chassis’s overall flex. Down here you’ll also notice some air intake cuts, and there’s also an intake on top of the keyboard, with the exhaust grills placed on the back edge, a pretty much ideal arrangement . Asus also advertises a patented Anti-Dust solution implemented on this computer (illustrated in the clip below), which should keep dust out of the fans and the internals. The IO is somewhat limited here though. You do get 3x USB A slots, HDMI and LAN, but there’s no USB-C of any kind and no card reader either. You’ll also notice that all the connectors are grouped on the left edge, which is great news if you’re a right handed user, but not that much if you’re a lefty. 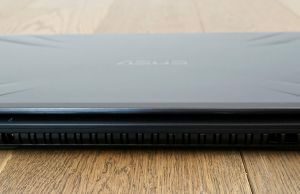 All in all, the Asus TUF FX504 is well built, nicely sized and fairly nice looking as well, with some arguable design elements, which at the same time make it stand out from the competition. Asus advertises this series’s durability and toughness, but aside from perhaps the choice in materials used for the outer-shell and the Anti-Dust technology implemented for the cooling solution, it doesn’t seem to meet any sort of recognized durability standards, so we’ll have to wait and see how these perks actually verify with real life use. 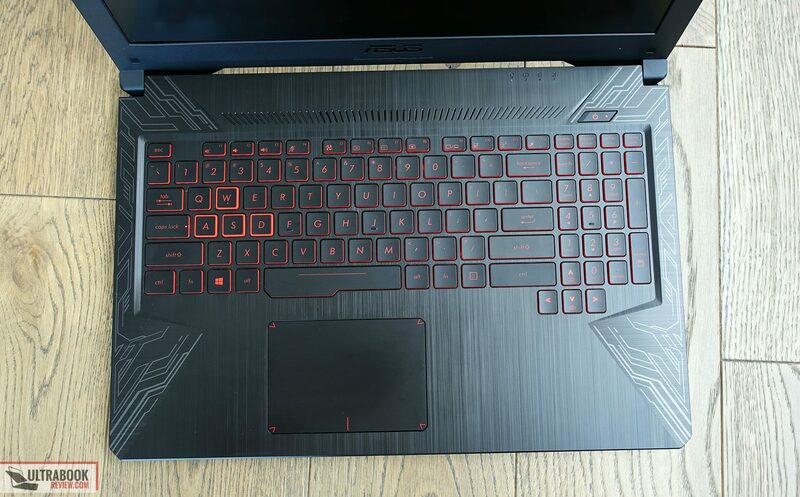 I have a few complains about the layout, namely the fact that the NumPad section is cramped and the directional keys are quite narrow, which isn’t ideal for a gaming laptop, but at the same time I do like that they’re placed somewhat lower on the chassis and I also like the large Space key, both elements we’ve seen on previous Asus ROG laptops. 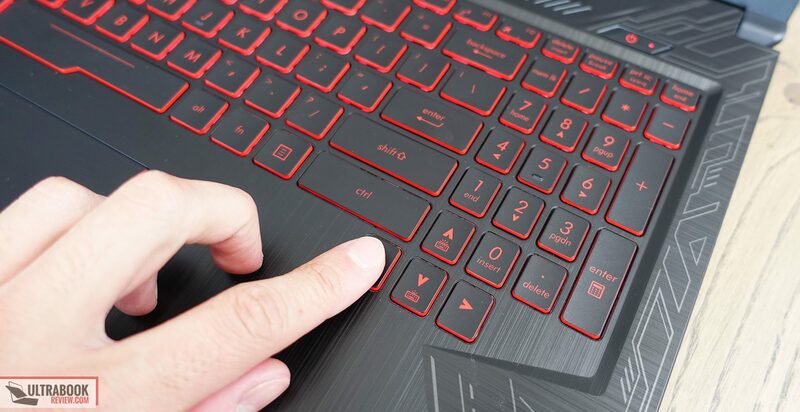 In fact, the entire keyboard is similar to the one of the ROG GL503VD, but the dedicated multimedia keys have been left out. This keyboard shines when it comes to the overall typing experience though. The keys click well and offer the right amount of resistance and the right feedback, at least for my taste. They’re also backlit (with red illumination) and quiet. 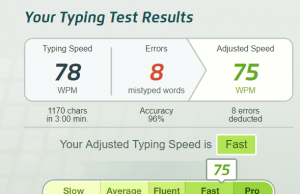 While typing this article I did however notice that the Left Shift key needs to be pressed firmer than I’m used to in order to actuate properly, which lead to a few errors while getting accustomed to this keyboard. 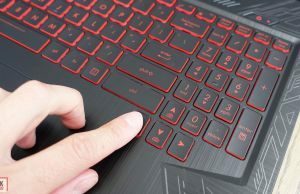 As a side note, Asus also claims the keys have a 20 million presses life-span, which is to some extent a marketing gimmick, but at the same time ads to the nice experience and can be another reason to consider this computer for serious typing and for gaming. The clickpad is alright. 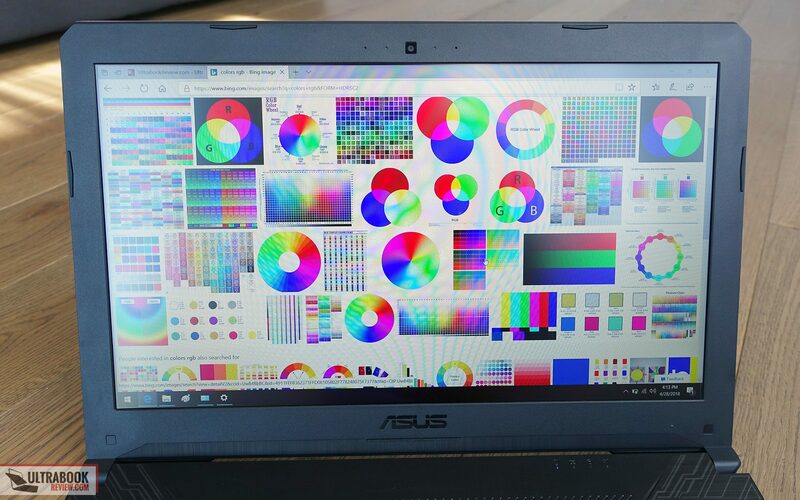 It’s a plastic surface made by Elan, with Precision drivers, and it performed well during our time with this laptop. It doesn’t handle one particular use case that well: having one finger on the left click area and swiping with the other, which it sometimes interprets as a two-finger zooming gesture, but this aside I didn’t notice any other quirks. The physical clicks are fairly nice as well and they’re silent, just make sure to press towards the corners though, otherwise they can get a little stiff. 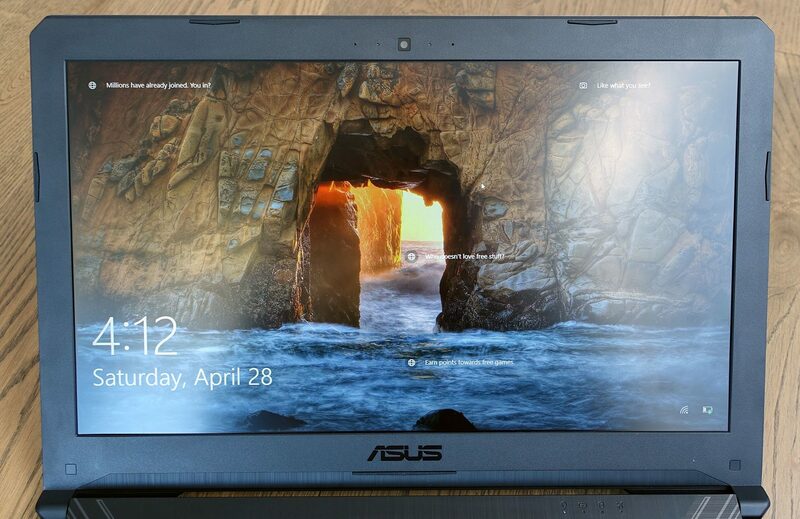 Asus equips the TUF FX504 series with a 15.6-inch matte screen, but with a TN 120 HZ panel. So it’s a win some, loose some situation. 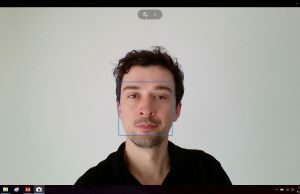 On one hand TN panels get poorer viewing angles than their IPS counterparts, but this one’s are actually far from bad, with contrast and color shifting only noticeable from upper and lower angles, but not that much when watching the screen from the sides and not at all when watching it head-on. On top of that, this screen is brighter and with richer contrast than the IPS panels available on other laptops in the $800 – $1000 price range, as you can see below. 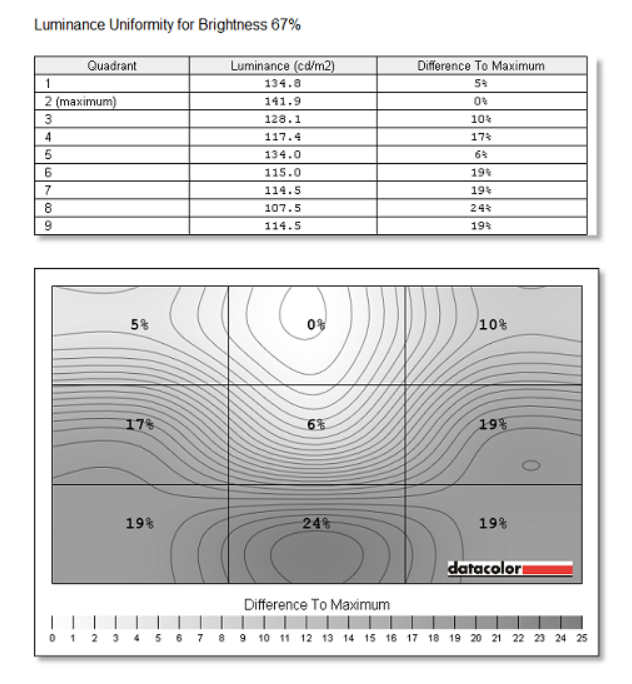 Average DeltaE: 9.49 uncalibrated, 1.45 calibrated. 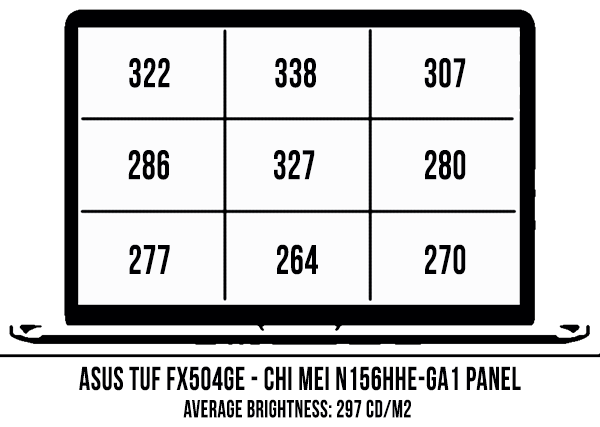 The panel is however very poorly calibrated out of the box , with a cool White Point, skewed Gamma and gray levels, so you should definitely calibrate it or use our calibrated color profile available over here. 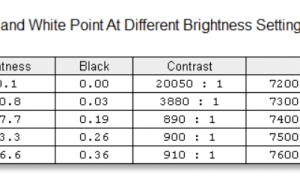 The brightness distribution is also poor, with certain parts of the screen dimmer by around 15-20% than the center and the top, but I don’t think you’ll actually notice this with everyday use. I for one didn’t. These aside, this TN panel offers a 120 Hz refresh rate, which will make your gaming experience much nicer, albeit you’ll probably want to lower the details in order to get high frame-rates, as there’s no GSync on this series. It also gets faster response times than a standard IPS screen, which once more helps in games. I’ll also add that this ChiMei panel uses PWM for brightness modulation, but at at high frequency of around 26000 Hz and only for brightness levels between 0 and 25%. All in all this screen is much nicer than you’d expect from a regular TN panel. Going with it Asus sacrificed the brightness distribution and vertical viewing angles to some extent, but offers potential users 120 Hz refresh rates, solid contrast and brightness, as well as good colors (once calibrated), so I for one prefer this option over any of the lower-tier IPS screens that most other OEMs put on their mid-range gaming computers. 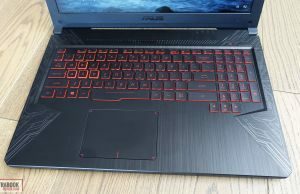 Asus offers the TUF FX504 in a few different configurations and we got to review one of the higher end variants, the FX504GE model with an Intel Core i7-8750H processor, Nvidia GTX 1050 Ti graphics, 16 GB of RAM and dual-storage, with an M.2 SATA SSD and a regular 2.5″ mechanical HDD. 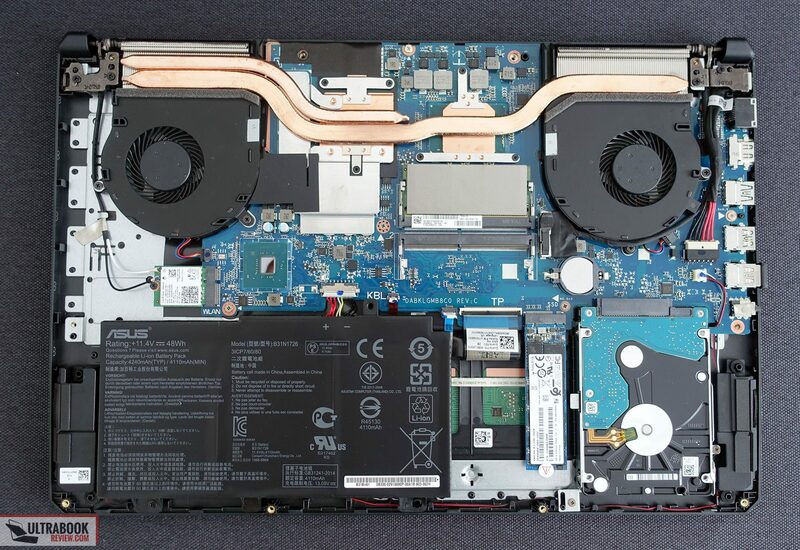 The RAM, storage and Wi-Fi chip are all upgradeable on this laptop and fairly easily accessible; in order to get to them you’ll need to take out the entire back panel, hold in place by Philips screws, all clearly visible around the sides and in the middle of the panel. Be careful that the screws are of different length, so take note where each comes from. Inside you’ll notice the two memory DIMMs, the M.2 slot and the 2.5″ bay. 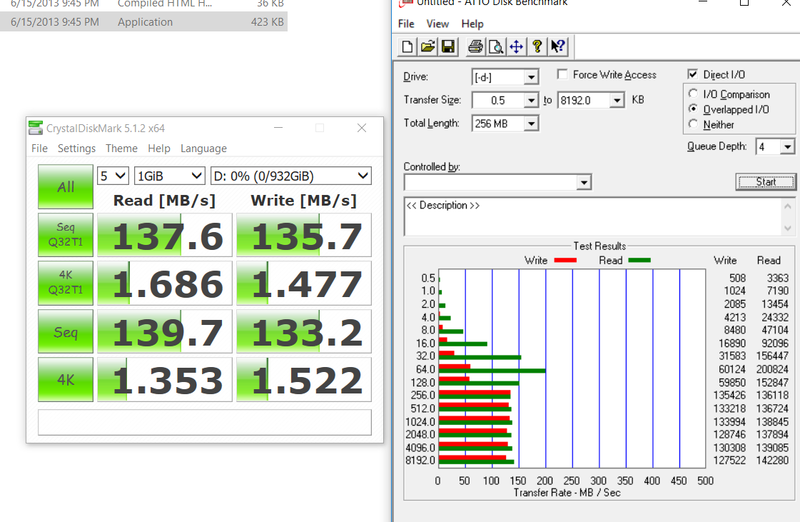 Our test unit comes with a SATA M.2 SSD, but this laptop supports faster M.2 PCIe drives as well. 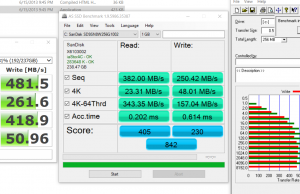 I should also mention that Asus equips the FX504 series with Seagate Firecuda SHDDs, which are supposedly some of the faster 5400 rpm HDDs out there and should help with loading games and applications. 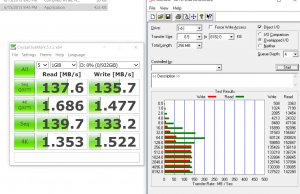 As the benchmarks above prove though, these SSHDs are far from the performance of even a SATA SSD. 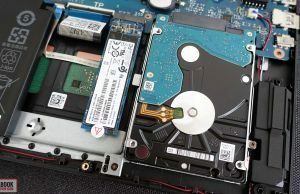 In other words, in case you’re opting for one of the lower end configurations of this laptop that are only equipped with a SHDD, you should seriously consider putting an SSD inside as well, as it’s a simple upgrade, but with a significant impact on the computer’s overall snappiness and experience. The Coffee Lake i7-8750H processor is perhaps the big novelty here, as it’s a six-core twelve-thread CPU and greatly outmatches the KabyLake i7-7700HQ CPU used in most similar laptops launched in the last years. 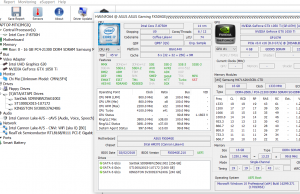 Check out this article for an in depth comparison between these two processors. On the other hand, you should consider whether you’ll actually put this processor to proper work or not, as it shows its strengths primarily in those applications that can benefit from the increased number of working cores and threads. For primarily a gaming notebook I’d also consider one of the more affordable i5-8300H configurations. I would however stick to the GTX 1050 Ti graphics available on the FX504GE models if the budget allows, as it’s 15-25% faster than the GTX 1050 option available on the FX504GD models and this will help with games down the line, as they become more demanding. As far as performance goes, this laptops handles everyday chores like music, video content, browsing and so on easily, and you’re definitely not going to need the i7 processor for such kind of tasks. 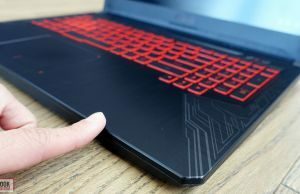 Things get a little iffy when talking about the performance in demanding loads, benchmarks and games, but keep in mind that the impressions gathered in this article are entirely based on our experience with our review unit, and you should also check some other reviews in order to get a better picture of how this laptop performs. Asus thermally limited our sample, which means that the CPU drops below its maximum Turbo Boost Speeds once the package reaches temperatures on high 70s – low 80s. 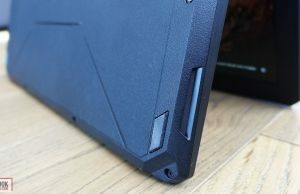 As a result, the benchmarks scored lower on this sample than on other laptops built on the i7-8750H processor we’ve tested in the past. 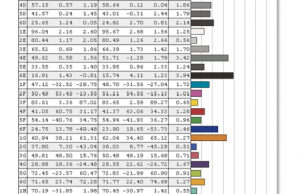 x264 HD Benchmark 4.0 32-bit: Pass 1 – 197.33 fps, Pass 2 – 64.54 fps. 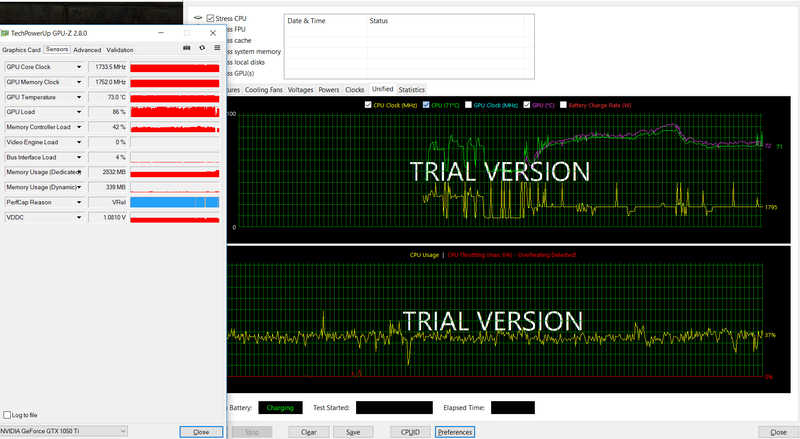 With Cinebench for instance, the CPU drops quickly to about 2.7 GHz and that’s why the initial multi-core results only get to about 960 points, and then stabilize at around 900 points with multiple consecutive runs. With games the CPU drops quickly to about 1.7 GHz, but the GPU runs well and the gaming experience isn’t affected much. At the same time the 6-core CPU doesn’t help. 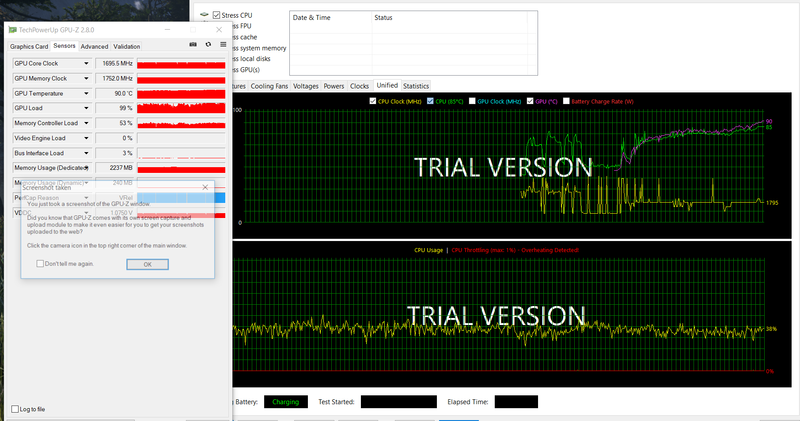 However, undervolting the CPU with Throttlestop to just -100 mV changes things. 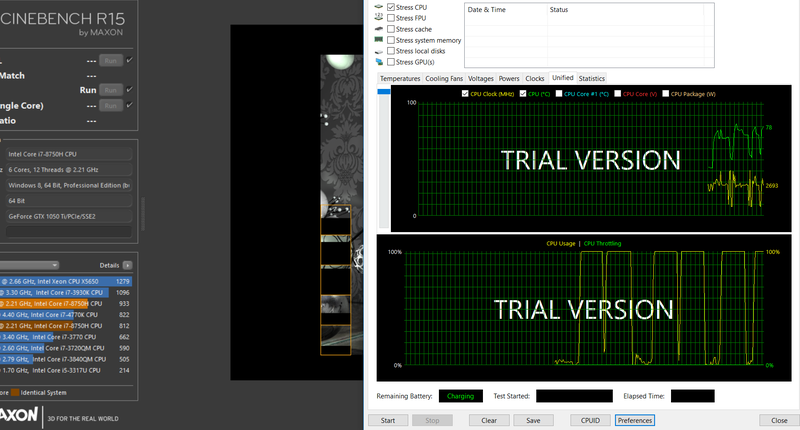 Cinebench scores jump to around 1080 on the first runs and then stabilize at around 1000 points with concurrent runs, with the CPU’s frequency dropping to just around 3.0 GHz now, while Geekbench multi-core and 3DMark Physics scores show improvements as well. 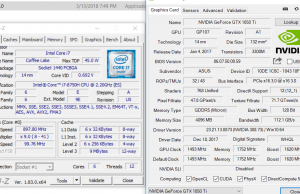 CineBench R15: OpenGL 106.06 fps, CPU 1076 cb, CPU Single Core 172 cb. The undervolting has a very little impact on the gaming performance, as the CPU continues to drop to about 1.7 GHz in some of the more demanding titles, but not as fast as it does with the default voltage. 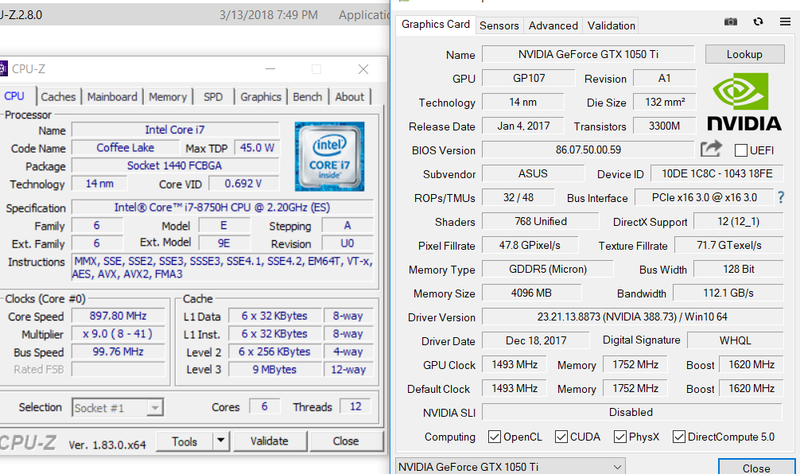 All in all our FX504GE sample performed out of the box poorer than other laptops built on the Coffee Lake Core i7 platform we’ve tested in the past. Asus aggressively limits the CPU’s speeds based on temperatures and the limit is set low, at about 80 degrees Celsius, which causes the lower benchmark results and poorer performance in demanding chores. This could be addressed on the final retail units with software tweaks, but if the hardware were to run hotter, the increased internal temperatures would also translate in the outer-case reaching higher temperatures, which as you’ll see in the next section, is already quite unpleasant. Update: It’s worth noting that quite a few buyers complain about performance limitations on the final retail versions as well. Check out the comments section at the end of the post, as well as threads on Reddit and forums. With that in mind, I would mostly look at the GTX 1050 / 1050 Ti versions of this laptop, preferably with a Core i5 processor, as the higher end versions might not be worth what you’d be paying for, given the competition out there and these performance issues. Asus implemented a rather standard, but deprecated by today’s standards imo, cooling solution on the FX504 series, with two fans that flank the hardware and two heat-pipes, a thicker one that spreads on top both the CPU and GPU, and an extra thinner one that goes just on top of the GPU. 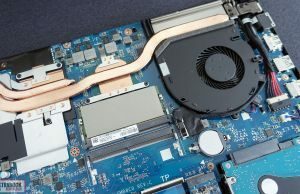 This is different from what they’re using on the ROG GL503VD models (the step-up from the FX series), which get two full-size heatpipes covering both the CPU and GPU, but a solution we’ve seen on other budget notebooks as well. On top of that, the intake grills on the bottom are limited, albeit the design might suggest otherwise, as the air only gets in through 4 small cuts, two on each side. I’d reckon this has something to do with the dust defender solution implemented on this line, but it also has a negative impact on the cooling’s performance imo. Combine the two together and you get a fair explanation for the CPU’s thermal limitations. As a result, this laptop runs warmer than most others in its class with daily activities, yet at the same time the fans stay mostly off in this case, with the CPU fan kicks in from time to time, but remaining pretty much inaudible. You’ll also hear the HDD cranking in a quiet place, and some occasional electronic winning as well. With games the fans get noisy, averaging 51-52 dB at head-level, so you’ll need headphones to cover them up. Asus offers three Fan profiles (Silent, Auto and Fan-Boost), and we used the Auto profile in our tests. The fans are much quieter while running games on the Silent mode, but the CPU and GPU also run 10-15 degrees hotter (the CPU reaches low 80s and the GPU reaches 90s) and I wouldn’t recommend playing games on this mode for too long. So keep the laptop on the Auto Fan mode, or on Fan-Boost if you’re using headphones. Out test unit also gets fairly hot in certain spots, but in all fairness not hotter than other computers with similar builds and hardware. 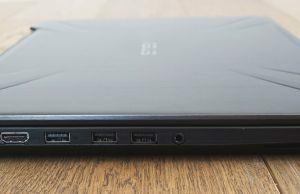 However, the hottest area on the FX504 is somewhere between the O, M and Enter keys, and your fingers will get in touch with it more often than if it would have been above the keyboard, like on most notebooks. It’s also strange that the laptop’s interior and keyboard deck runs hotter than the bottom, which suggests perhaps some arguable design decisions or some issues with our test unit. 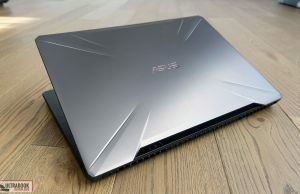 As far as connectivity goes, the Asus TUF FX504 gets Gigabit wired and Wireless AC Internet connections, as well as Bluetooth. 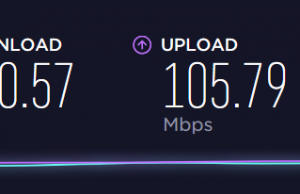 We’ve mostly used it on wireless, and the newer generation Wi-Fi AC 160 Hz Intel 9560 module integrated on this sample performed flawlessly both near and away from the router. Two speakers are in charge with the sound and they fire through some small cuts on the sides. They’re averagely loud at around 79-80 dB at head level, but the audio quality is rather mediocre, as they sound tinny and with little bass. 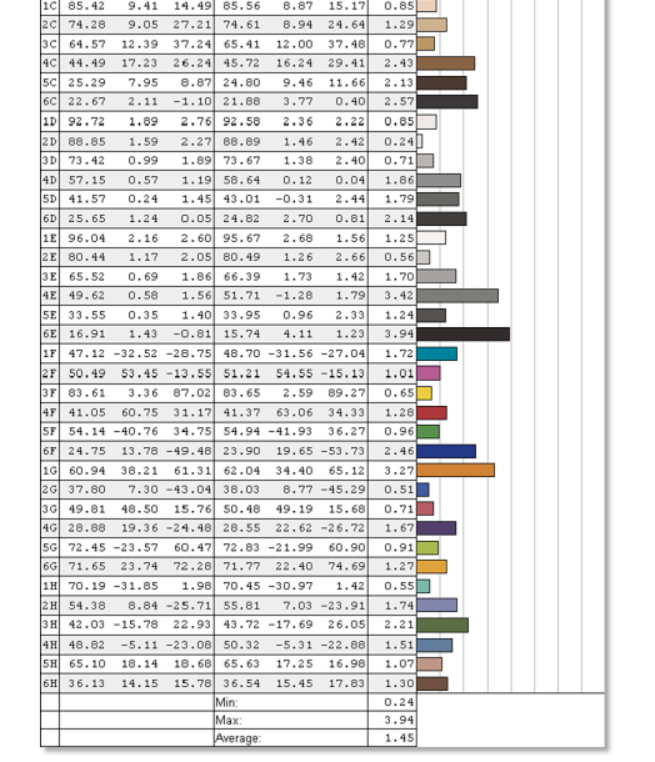 Lows are in fact only noticeable from around 95 Hz in some of the tests we’ve ran. As a side note, our sample came with a piece of software called DTS Audio that can help tweak the audio, which had the options for Bass Boost and Surround activated by default. I’d advise you to untick them and slightly adjust the levels in the equalizer to match your preference, as the sound output can be slightly tweaked and improved this way. Just don’t expect much. One of this laptop’s selling points is also its ability to output 7.1 audio through the headphone jack, which should improve your gaming and movie-watching experiences when hooking peripherals that support multiple-channel audio. 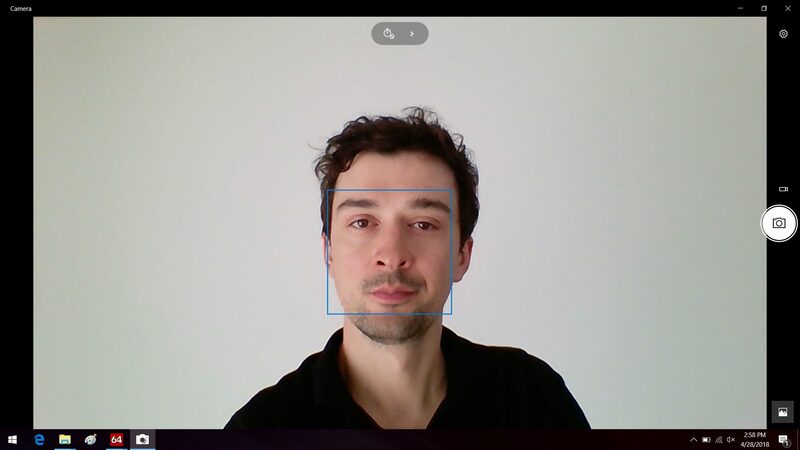 I’ll also add that the FX504 gets a decent 720p webcam at the top of the screen, flanked by microphones. It’s nothing to brag about, but takes alright images in a properly lit room. 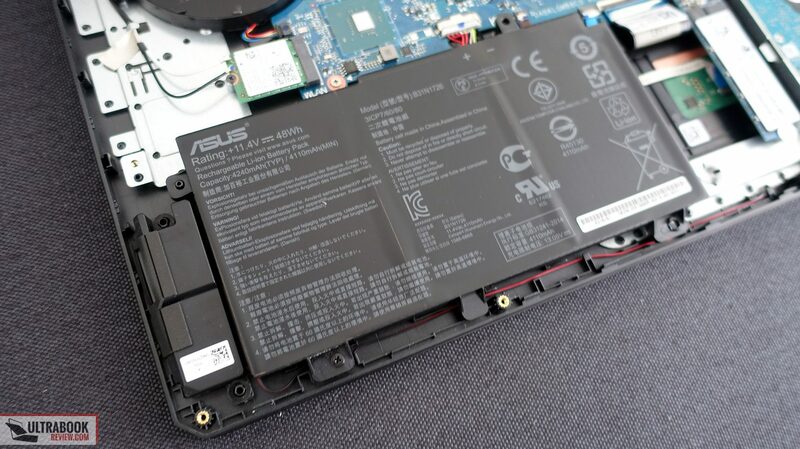 There’s a 48 Wh battery on the Asus TUF FX504, which is rather small for this day and age, so you’ll have to accept that the battery life is not this one of its main selling points, even if there’s Optimus on-board, which means the Nvidia GPU switches off and the Intel chip takes over for daily activities. 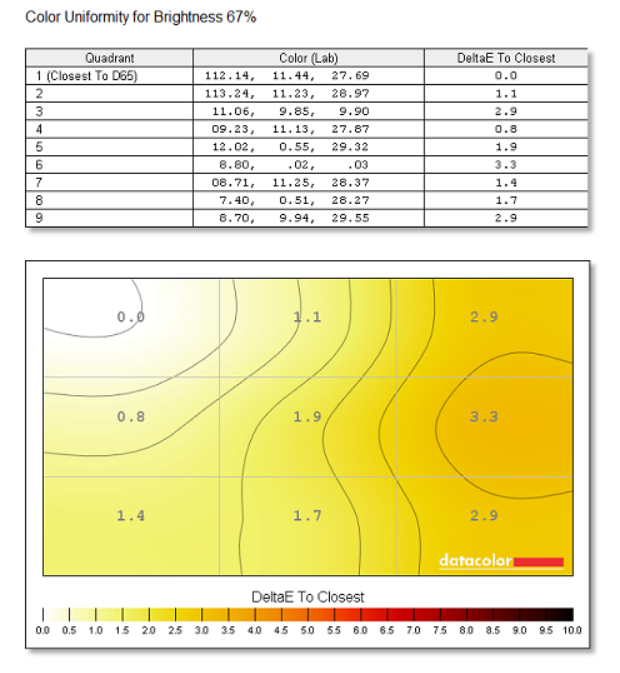 For some reason HWInfo did not properly run on our test sample, so we can’t offer our standard battery readings with different scenarios. However, we got around 6 hours of FHD video, 5-6 hours of Youtube streaming and 3 and a half hours of everyday multitasking, with the screen’s brightness at about 30% (roughly 120 nits) and Balanced mode selected. 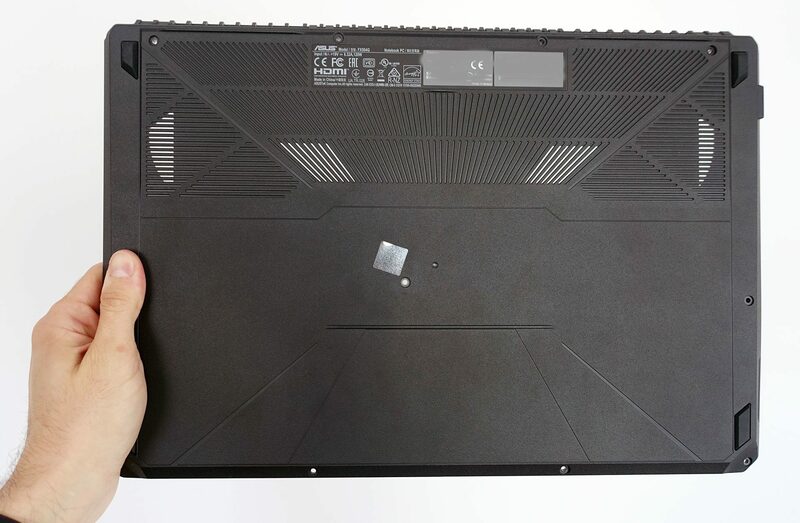 The laptop comes with a standard 120 Wh power brick and a full charge takes around 1 hour and 30 minutes. The Asus TUF FX504 is available in stores around the world as of late April 2018. The base configuration of the FX504GD series, with an i5-8300H quad-core processor, 8 GB of RAM, GTX 1050 graphics and a 1 TB Firecuda SHDD, starts at $700 to $800 in the US, while the FX504GE models with the i7 processor, more RAM, SSD storage and GTX 1050 Ti graphics go for around $1000 and the FX504GM with GTX 1060 graphics for around $1200. Various configurations of the TUF FX504s are also available in Europe and the UK. Just keep in mind that if you opt for one of the base models you should also add an SSD in the M.2 slot. 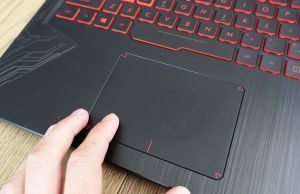 That aside, while the i5-8300H is fast enough for daily use and games, the GTX 1050 is considerably slower than the GTX 1050 Ti alternative and given this laptop comes with a 120 Hz screen and no GSync, you’ll want the faster option in order to get the better gaming experience without considerably trimming down the details in the newer titles. Follow this link for more details on the FX504 series, updated configurations and prices at the time you’re reading this article. 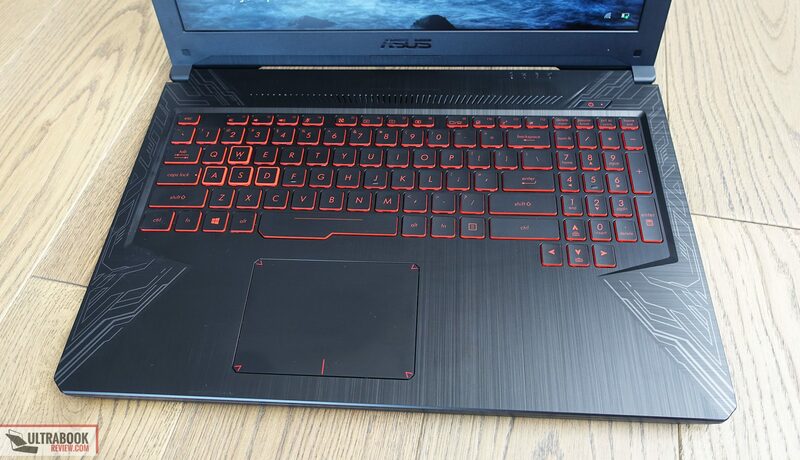 As of late April 2018, the Asus TUF FX504 is one of the first mid-range gaming laptops to sell with Intel Coffee Lake hardware. On top of that, Asus checked a lot of the right boxes with this product, so it should be on your list of you’re shopping in the $700 to $1000 price range. 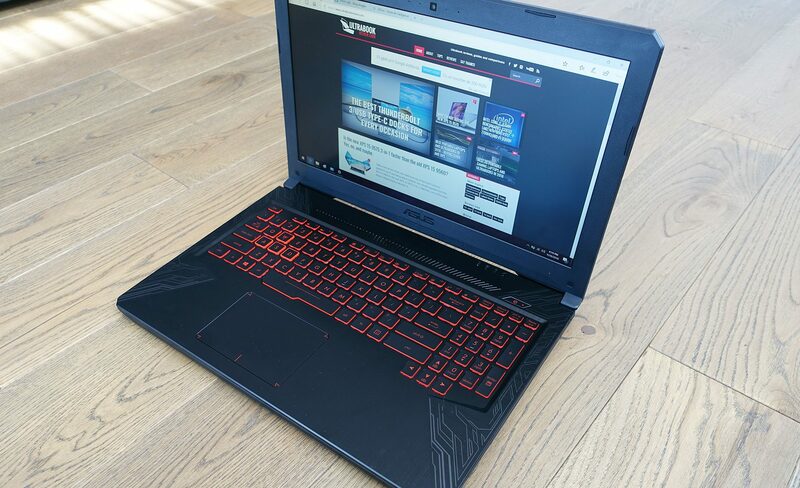 The main selling points are the construction, the 120 HZ screen, the keyboard and the hardware, alongside perks like the anti-dust cooling system, the 7.1 capable audio output, the fast wireless or the advertised durability. Battery life, connectivity and speakers are just about average, while my main concern regards the performance of the higher tier configurations in demanding loads and whether the implemented cooling is able to keep the six-core Coffee Lake Core i7 processor and that GTX 1050 Ti graphics at bay. Our sample ran into some issues, which in all fairness were partially addressed with undervolting, but make sure to read other opinions as well to see how the retail versions end up working. 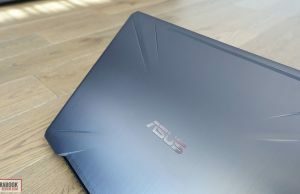 Update: As of the second part of 2018, Asus offers an updated versions of this laptop, the TUF FX505 series, with a smaller build, 144 Hz IPS screen and improved performance. You can find all about it in our review. The TUF FX504 series is aggressively priced, but competes in a highly competitive niche. 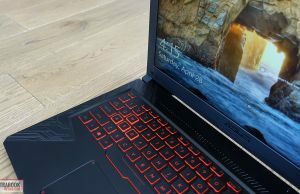 If interested in a budget option, the Acer Nitro 5 or the Lenovo Legion Y520 are alternatives worth considering, and if you’re shopping for the higher tier configuration you could also consider the MSI GL63 or even the aggressively priced Acer Predator Helios 300, which would get you GTX 1060 graphics for not much extra, especially on a good deal. This pretty much wraps up our review of the Asus TUF FX504 series. 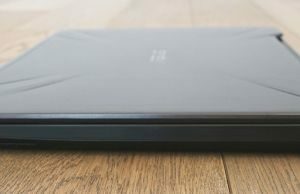 The comments section below is open for your feedback, suggestions and questions, so get in touch if you have anything to say or need help deciding on your notebook to be. Strange, my fx504 with i5 and 1050 is also hot in that place (between o,m and enter key) which supposed there's no heat source here. Hope there will be more in depth review wich explain why. I'd reckon the heat from the GPU somehow spreads towards that area, but yes, it's a bit strange it doesn't heat up further up, where the GPU is actually placed. Taking out the motherboard to see exactly what's on the back under that area should perhaps offer a better reply, but I no longer have my review unit. I heard that there is a fx504 model with gtx 1060 in it.(fx504GM). Would you please check if its available worldwide? Do you think it is suitable for a university student? Taking foundation in science this year and hopefully computer science after that. Seems like the ones sold in Malaysia are only 60hz screens. I'm considering either the i5,TN (RM3299)or i7,IPS (RM)3899 both with 1050 as the Ti is out of budget…any recommendations on this? Or any other laptops? 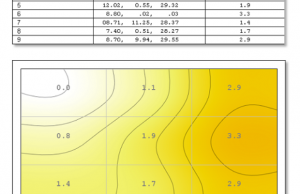 What we can expect from 6 core turbo boost in real world scenario? E.g. some optimized multicore game. HWinfo didn't work on this sample, so I don't have the usual logs. 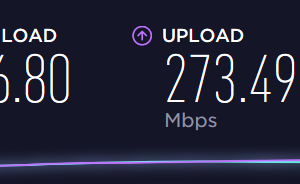 Should be higher though, with undervolting. What a great, in depth review. This really helps and helped me make a decision. The i7 version is currently on sale for $799 on B&H so I went for it since I been shopping for a while. Thanks! Same here. bought this from b&h for $799. currenty facing fps drops while gpu reaches 100% usage very frequent. 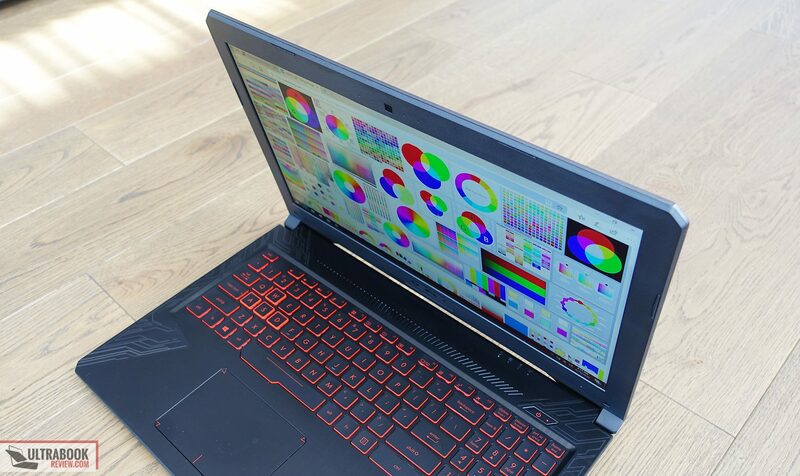 overall nice laptop. watch my comment down for undervolting. 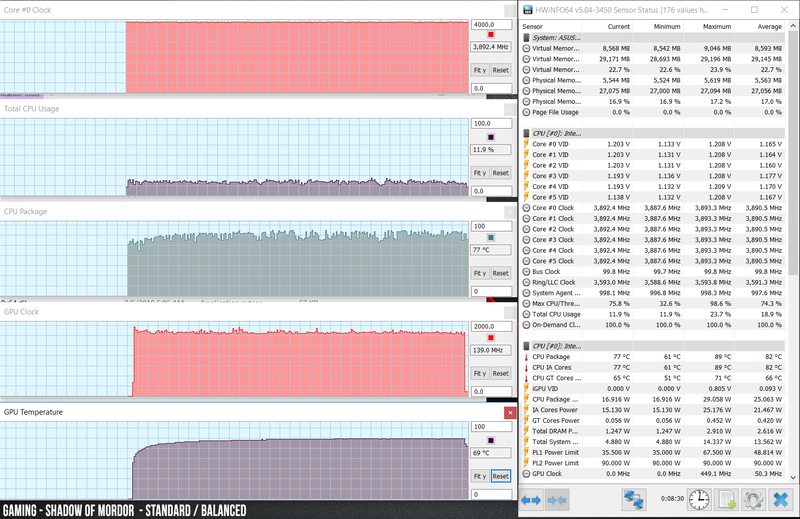 -99.6mV on cpu and -94.7mV on cpu cache found to be sweet spot. tested with CPUz bench. For the model I own expect the CPU to power throttle when on high CPU loads as a result the clock speed will be limited to the base speed of 2.2 GHz and turbo boost will not kick in even if it is enabled. So, for video editing, rendering, CAT simulations, etc. it will not perform as expected. You might be saying “this is a gaming computer, it is for gaming” well, it is a failure at that too. For the same CPU power limitation and clock speeds bouncing all over the place you will constantly have to cope with framedrops and stuttering in any game. To kind of solve the issue you will have to underbolt the CPU and GPU. The worst part is that I contacted Asus on this regard and they have admitted there are some issues with the design and provided a ton of excuses on why it might be, but, are not willing to solve the problem. They suggest entering the PC to a service center for “fixing”, most likely they will change the motherboard or other components but most likely it will continue the same as there is no damage on the PC just a poor design. They will not provide a replacement computer either and if you bought the PC in other region you are screwed as their “international” warranty will not cover you on another region meaning you will have to ship the computer to wherever it was bought. Save your money and look elsewhere. Wow, that's quite an experience. Did you try anything to fix the performance, like Undervolting? 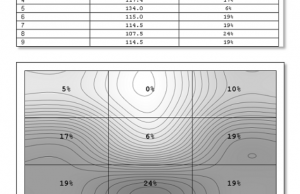 What are the CPU temperatures on your unit, throttling to 2.2 GHz is different than what I experienced on my sample. Soo is this software problem or hardware problem i mean can Asus Will fix it in updates? & can MSI gl63 -8rc i5 8th gen with gtx1050 & TN panel…. Better option than this..
Seconded. I bought this and noticed all the problems mentioned by plmoijn. Contacted asus less than 24hr after purchase to ask more, same result as stated above. No real help. My clockspeeds averaged ar 2.4, and tdp 25w under stress tests with .085v undervolting. Mine is a 1060 with i7 coffee lake. Hello, I am thinking to buy this product I want to develop games, what else should I buy under 75,000. Please advise. Thank you. too vague for a specific device. try to join r/suggestalaptop and fill a form or their discord, or this website forum. I am getting bas stuttering at the start of games usually… Idk why… Haven't got to monitoring the stats yet, what software do you recommend? Alright thanks, quite busy lately with tests and assignments, will try to run tests whenever I'm free. 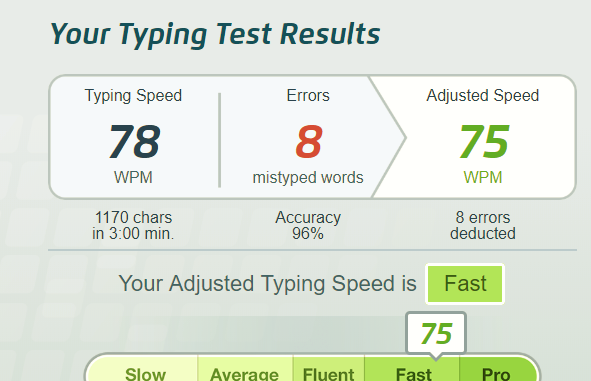 Weirdly enough i get stutter usually at the start of games and after a while it's usually smooth. Do you have an SSD? And how much RAM? Well, that explains plenty imo. An SSD makes a lot of a difference in any laptop, and 4 GB of RAM are just not nearly enough these days with Win 10 and most software. Consider upgrading to at least 8 GB of RAM and a 128 GB M.2 SSD for the OS and programs, it will make your laptop much faster. Hmmm, are you seeing any stuttering while playing games? I can see the GPU's clock going down intermittently, that could suggest some issues. The CPU runs fine. As for the upgrades, I would definitely recommend both the SSD and more RAM in time. Normally the SSD makes the most difference on a laptop, but in your case the extra RAM is going to help as well. Well yes as I have mentioned in previous comments. Can't explain those. Did you try the latest drivers and maybe BIOS update to the latest version? Already updated all drivers pretty much, and the BIOS automatically updated few weeks ago. 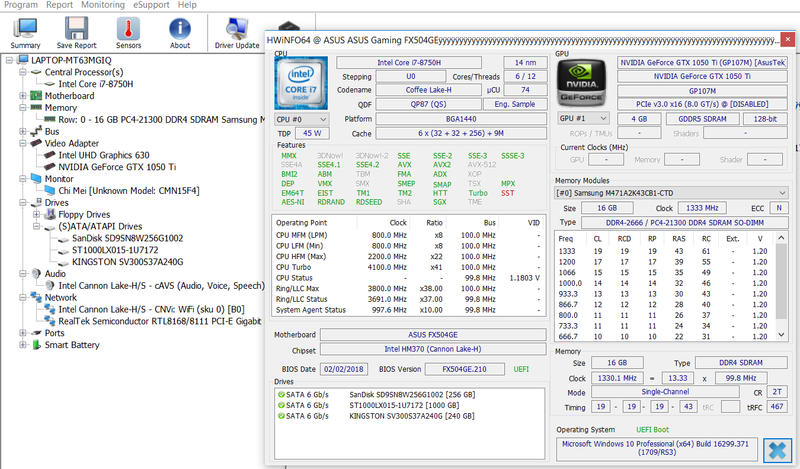 The thing ia my old Acer aspire 5 could run overwatch on lowest possible settings around constant 20+ fps no stutter…. Hi there … I wanted to buy this laptop ( the fx504gm with the GTX 1060 and the 8th gen I7) but after reading these comments I am a bit confused…. 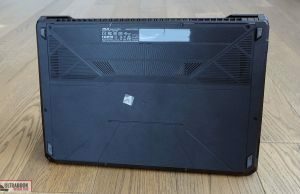 Is this laptop a good buy? I will mostly use it for video editing (no 3d work , just for YouTube) on Adobe …. 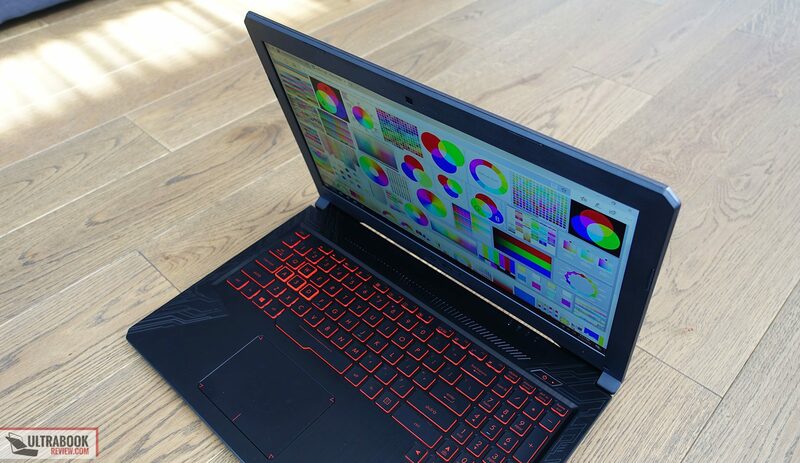 Making PowerPoints,Word,Excel,web browsing and occasional light gaming (pubg , fortnite , overwatch , bo4 blackout Cs:go ) so my question is….. Is this laptop good … Becos here in India most laptops are a bit expensive than in the US otherwise I would have gone for the predator 300 helios (but that'll break the bank ) …. I have an external fan / laptop cooler so will I get better results with that ? …… Overall is it a good buy for the things I have mentioned above ? I just need a good machine that will last me long and get the job done …. 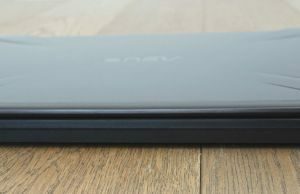 Also if there are any other laptops I should consider do let me know…. Gaming is problematic, you're not going to get the best out of that GTX 1060 chip, but you can undervolt the CPU/GPU in order to get better performance than the system delivers out oft he box. Repasting is also an option, but will void warranty. Overall I wouldn't recommend the GTX 1060 versions of the FX504, but if there's no other alternative and you need the 1060, you could give it a go and see how it does for you. BTW thx for the early reply…. 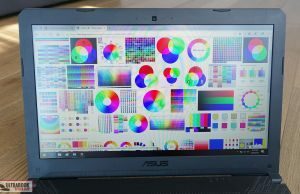 You can start your search from these two articles: https://www.ultrabookreview.com/21576-laptops-with-144-hz-screens/ and https://www.ultrabookreview.com/11702-laptops-nvidia-1060/ , but you might not find anything better priced than the FX504. Hmm…. 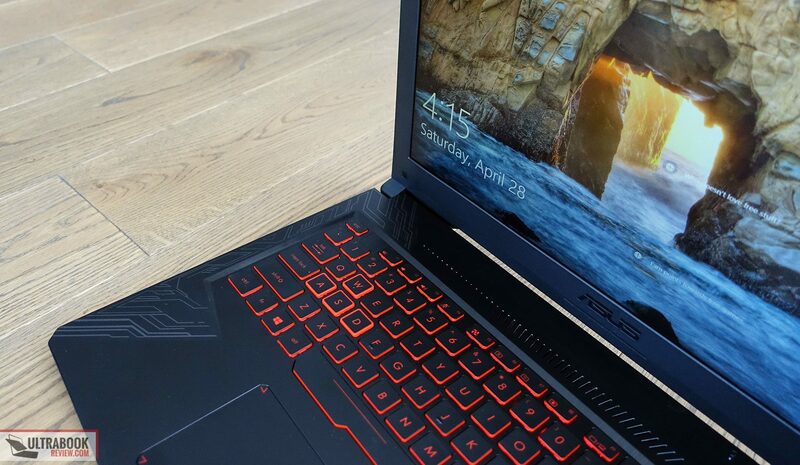 I have decided to go with the Acer predator helios 300…..is it a good choice? It does have everything I need but the processor is the coffee lake 7th gen I7…. Does that still hold up in late 2018 ? Will it last me a few years ? Does it suffer from the stuttering problem that the TUF suffers from too? 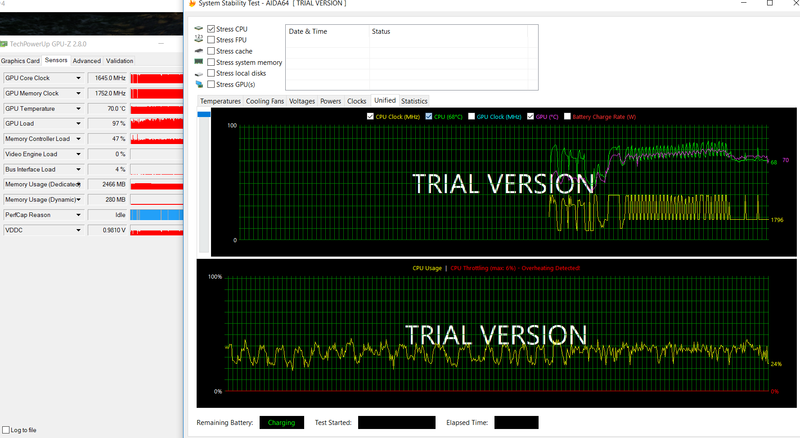 There should be no stuttering, but the 8750H is significantly faster than the 7700HQ, as it's six-core 12-thread. We do have a review: https://www.ultrabookreview.com/19445-acer-helios-300-coffee-lake-review/ . Glad I could help, let us know how this goes for you after you get it. Will ask the shop i got it from, thx. Oh my, that's awful performance. This unit doesn't work nowhere near how it should, get in touch with the store for a return/exchange. This is after changing Nvidia power management to "Prefer maximum performance" but I still get stutter, also tried a few different versions of the gpu drivers, no luck. I'd reckon that happens when the performance stutters? The computer freezes and that causes the noise. I'd reckon that extra RAM and an SSD should help with all your issues, but I cannot guarantee. Does a slow harddisk and insufficient RAM cause a GPU to behave like that? Hard to tell. Normally no, but based on that latter log with the GPU set on High Performance, the GPU drops don't seem as dramatic as with the earlier logs you've sent and shouldn't cause so noticeable hiccups. That's why I'm inclined to say the SSD and RAM will help, but I can't tell for sure if they'll completely smooth things out for you. Bottom point, my advice would be to claim this laptop doesn't work properly and ask for replacement or just return it to the shop, if possible in your country. How much is that? I've seen people complaining about some performance issues in this FX. I didn't run into them with the review unit, but something to keep in mind. Is this a right choice for photo editing? I'd rather get something with a nicer IPS screen. Colors and contrast are pretty poor on this kind of TN panels. What's a better purchase between this (i5 8300H; 4gb RAM)and an ROG GL503VD (i5 7300HQ; 8gb RAM)? Both would boast a 1TB SSHD and GTX 1050. Or do I just save the dough and buy Acer Nitro 5 with an i5? The 8300H is quad-core with HT, so faster in multi-threaded applications than the older i5. If those are the same price, I'd get the 8300H model, but I'd also add more RAM. 4 GB are definitely not enough today. However, if the 7300HQ config is cheaper, I'd rather get that and use the difference to add an SSD for the OS, it would greatly improve the experience with that laptop. Then perhaps your version only gets a 60 Hz screen. Can you check for the Panel's HWIf in Device manager and see what panel you have on your unit? Could you teach me how to undervolt my asusfx504ge? 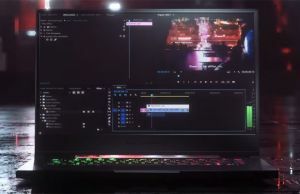 Hi, Is this same configuration of this laptop capable to handle 4k/30fps video editing and rendering in Adobe Premiere Pro and some basic use of Adobe After Effects and Adobe Illustrator, not necessarily all 3 software used at the same time though. For this purpose, I also use a 32-inch 4k monitor, not at all depend on the Laptop screen though. Despite all shortcoming, Is this machine serve my purpose? Please reply. What's the base version? I'd get at least the i5 and 16 GB of RAM for such tasks, but preferably go for the i7 if possible. Thank You for replying, I like to pick the version which is i7-8750H/ 8GB RAM/ 128 GB M.2 SSD/ 1050 Ti 4GB Graphics for the all the above mentioned Adobe CC works with a 32-inch 4k monitor connected via HDMI port. I will upgrade RAM and SSD later. My main requirements for 4k Video editing and rendering… Hope the configuration handle the tasks decently. 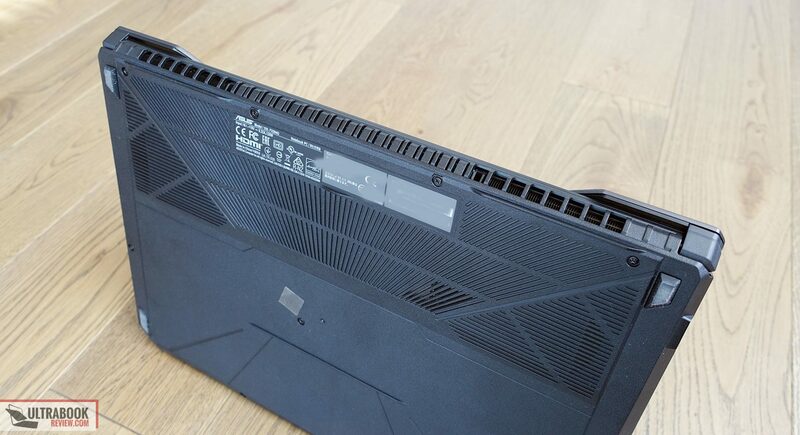 The thing is, the 8750H runs at high-temperatures inside this laptop. That aside, while we were not able to run all our performance tests on our sample, based on the benchmarks and other reviews, you should know that you'll run into performance issues with demanding loads like the ones you're primarily interested in. 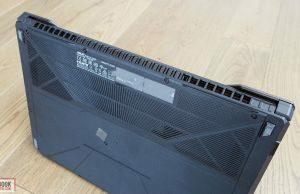 With that in mind, I would rather look at a similar configuration of the Lenovo Legion Y530 or Acer Nitro 5 /Predator 300 if these are within your budget in your country. You'll find reviews here on the site. I'd also consider undervolting the CPU in order to get the best performance out of it. I added a stick of 8gb DDR4 2666mHz, the stuttering is gone and I can play Overwatch on Ultra at 60fps (Most of the time I think, always forget to look at the fps counter during chaotic fights). Thermals still not too good, the CPU clock rate drops from 3.9 to 2.2 when gaming still (It's due to the bad cooling system ASUS used on this unit. And ASUS now has a FX505 series like really?! 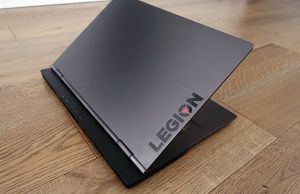 Would you mind reviewing that as well and the Lenovo Legion Y530 and Y730? Check the reviews section, I already reviewed the fx505 and y530. Did you undervolt the CPU? Should help keep those frequencies a bit higher, but even if it clocks down to 2.2 GHz, that should only have a minimal to no noticeable effect on the gaming performance. 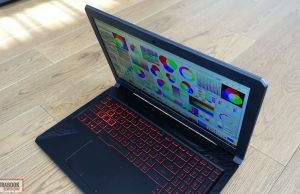 Hi there… I saw the review and the Msi leopard is a good laptop too but the question still remains… Which would you prefer the 2018 predator helios or the 2018 msi leopard? Both have pretty much the same specs and I like them both ….. But the helios exceeds my budget so I wanted to get the Msi . I have a few questions about it …. Will it have any trouble handling my usual tasks ? (Gaming:fortnite,pubg, overwatch, Witcher 3, blackout, assassin's Creed origins . Alot of Video editing and PowerPoint presentation creation and some casual browsing and music ) does it throttle? Is it a good choice for gaming ? Is it a good buy in late 2018 ? Does it have any unexpected errors (like the Asus TUF) ? Haven't reviewed the MSI, so can't comment on it.